Wildflower Gardens - Gardening with Nature? Have you secretly been considering turning your high maintenance mixed border into a wildflower garden? It can be hard to resist when seed companies are out there promoting their instant wildflower gardens in a can, sack or roll. I spoke with a handful of gardeners who gave wildflower meadows a try. Their efforts to date have not met with much success. Many gardeners naively believe you can simply scatter some seeds, ignore the gardening basics, and wind up with a self-sowing meadow of bluebells and lacecaps. In truth, starting a wildflower garden is often more work than putting in a perennial border and it is not necessarily self-perpetuating. If these plants are truly wild, (weeds, to most highway maintenance crews), why must they be coddled and coaxed out of the ground? Well, let's start with what growing a wildflower garden actually means. What is a Wildflower Garden? According to my local Extension office, wildflowers are species of flowers that have shown themselves to be hardy and self-reproducing, with little attention form the gardener. Although they will grow wild or on their own, they are not necessarily native plants. 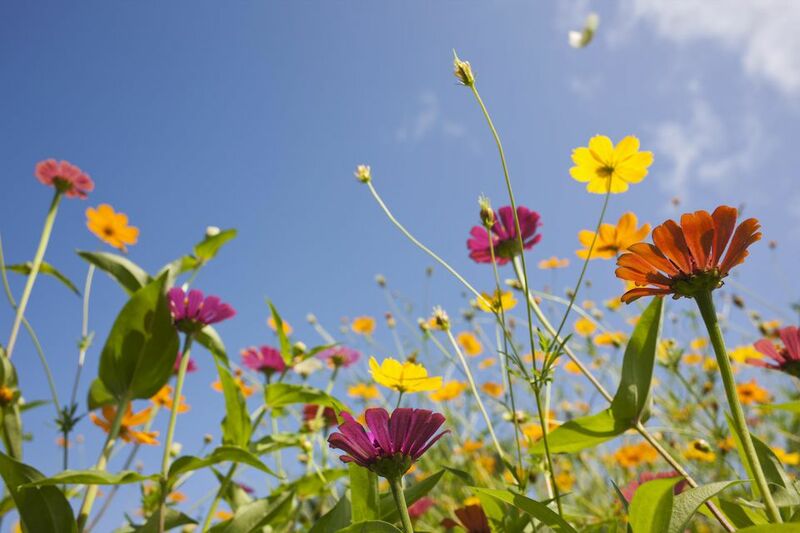 Wildflower gardens are considered a low cost alternative to high maintenance gardening. Many wildflowers prefer poor soil and neglect, making them ideal for tough to maintain areas of your property. I'm not sure I agree with that. My wildflower garden got little attention, but it did not thrive. Where did I go wrong? Even a wild look requires some planning and effort. The good news is that most of the effort is in getting it started. Chose a site with full to partial sun. If you want the plants to sustain themselves, you had better give them conditions they find agreeable. Weed control is paramount. Weeds are a successful wildflower garden's biggest threat. Of course, only you can determine what a weed or wildflower is, but for the sake of simplicity, I would suggest you start your garden with a clean palette and remove all existing vegetation. There are two proven methods of doing this. Weed or remove sod by hand. If you are starting with a small area or if you are planting where the healthy grass is growing, this may be your best option. Solarization is a good way to kill all vegetation, including most seeds. Mow the area to be planted as low as your lawn mower will allow. Water the area well and then cover securely with clear plastic sheeting, leaving it there to bake in the sun for 6 - 8 weeks. This method relies on cooperation from the weather and you will probably still want to remove the dead vegetation before reseeding. Till the soil shallowly to a depth of about 3 inches, once the existing vegetation is removed. You don't want to uncover and encourage more weeds. Rake and level the soil, leaving the grooves left from raking to help hold the seeds and give them contact with the soil. While wildflower seed mixes are cheap and easy to find, your best success will come if you purchase either individual plant seed or better still, plants. For more about starting a wildflower garden this way, see my interview with wildflower expert Miriam Goldgerger. If you prefer to go with a packaged seed mix, they will tell you how large an area they cover. In general, use 4 pounds of seed per acre or 4 oz. per 2,500 sq. ft. Most wildflower seeds are very small. Mixing some sand in with the seed mixture will make it easier to spread evenly. Broadcast evenly throughout the area to be planted. Rake lightly again after spreading the seed. Water the whole area and keep the seeds moist until they are a few inches tall. A light mulching with straw, peat or compost will help retain moisture and keep the birds from eating the meadow. It’s much like starting grass seed. Germination should occur in 10 - 21 days and your first blooms should reward you 5-6 weeks later. Can a wildflower garden become established and continue to self-sow, without becoming too invasive? Actually, the perennials won't bloom the first year and if you are hoping to enjoy the garden for years to come, an occasional over seeding will help to maintain the balance of plants. This can be done every couple of years or whenever you notice an imbalance, perhaps due to unfavorable weather conditions. If you are planting a large area and are going for a meadow look, you should consider including some turf grasses in your mixture to fill in thin spots and discourage weeds. Hardy fescues are a good choice in Northern zones. In warmer climates, Kentucky 31 or tall fescue are preferred. Ryegrass and bluegrass tend to be too competitive with the flowers and are not good choices. About 25 pounds of grass seed per acre would do. Once the plants are established they require very little care. Watering during dry spells will keep things looking their best and won't spoil the plants, making them dependent on your care. Weeds will try and invade, but wildflowers grow densely and initial weeding should be very minimal, becoming less and less as the garden fills in. "Mowing" is the major maintenance chore. In the late fall, after the annuals have gone to seed and the perennials are dormant, the whole area should be mowed down to a height of about 4-6 inches. If your area is too large to even consider chopping by hand, mow at the highest setting your lawn mower has. What you are doing is insuring the seed heads drop while tidying the appearance of the garden and discouraging the growth of any woody perennials that might take over. Build your beds the fall before you intend to plant. You won't have to fight all the annual weeds sprouting in the spring and you won't get impatient and be tempted to skip steps in your preparation. The best time to plant wildflowers is in the spring, to give them a good long season to get established and set seed. If you are starting later in the summer, be sure you have at least 8 - 10 weeks before frost, if you want them to self-sow. "Frost seeding" is possible in Zones 6 and up. Wait until the ground begins to freeze and then broadcast the seeds. Or you can put it off until very early spring when the ground is just starting to thaw. The seeds will get adequate moisture from the snow and good contact with the soil through heaving. Of course, this also requires that you prepare the bed the preceding fall. Consider building walkways in your meadow, so that you can get out there and enjoy the view. Here are some plant suggestions for attracting birds & butterflies to your wildflower garden. A bonus of a wildflower garden is the wild life it attracts, including butterflies, hummingbirds and beneficial insects. Don't Cover! Seeds That Need Light to Germinate.